The brand says it wanted to provide even more choices for consumers with plant-based diets. Mexican-inspired brand Boojum has launched a limited-edition vegan three bean chili. The new chilli consists of butter, kidney and cannellini beans combined with a blend of spices and seasoning to achieve a smoky, saucy flavour profile. The vegan item will sit alongside the brand’s existing burrito, fajita and taco filling options as a meat alternative, geared for customers who are turning to plant-based diets or opting to reduce their meat consumption. 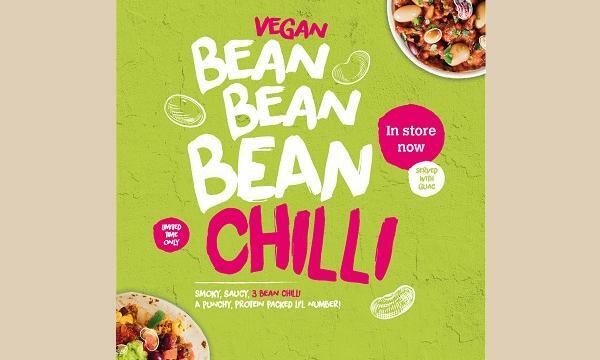 “We’ve always offered vegan options as part of our customisable format at Boojum, however in line with a growing trend for vegan menu items, our team have once again got creative and developed this delicious new Bean Chilli to provide even more choice and cater to a demand from more conscious consumers,” Boojum marketing head Nuala McMenamin said.